Do you know about any great resources for science writers that are out there? Books, videos, courses, articles - you are welcome to post them all here. One of my favourite places to teach myself about being a better writer is the CASW Storygram, where editors annotate pieces written by writers they have not edited, providing a line-by-line breakdown of what the writer is trying to do, how and why. An excellent free app for writers is the Hemingway editor - http://www.hemingwayapp.com/ . It highlights passive voice, adverbs, difficult-to-read sentences etc. The World Federation of Science Journalists (WFSJ) offers a free online science journalism course - http://www.wfsj.org/course/ . It is quite comprehensive and covers reporting, pitching, interviewing, choosing stories, planning visuals and much, much more. @mukunth Thanks for sharing Storygram - it’s a fantastic resource. Yes, I’ve recommended Hemingwayapp to a few writers before, although I haven’t heard from them about whether it was useful. Plus in the case of a tool like this, which helps perfect one’s basics, it’s important IMO to recommend it to others with the caveat that they should wean away from its prescriptions every now and then. I received the following email a few minutes ago. Posting it here in case anyone is interested. You’re invited to apply for the National Geographic/Out of Eden Walk Slow Journalism Workshop scheduled for Chennai from September 4-7, 2018. It will be led by Paul Salopek, whose Out of Eden Walk inspired this intensive, four-day workshop sponsored by the National Geographic Society. Other faculty include Prem Panicker, Arati Kumar Rao, and myself. Please follow this link for more information and to submit an application: https://goo.gl/forms/wTVGM0gEYbM46kYZ2. Space is severely limited, so please complete and file your application ASAP. Deadline: August 5, 2018. Coming from research background with no prior science writing experience, I found this course very useful and interesting:https://www.coursera.org/learn/sciwrite. It is a free science writing course by Stanford University, and I found the instructor quite engaging. Here is a course for women interested in science journalism, conducted by the British Council in collaboration with IISER Pune and Indiabioscience - https://indiabioscience.org/meetings/workshop-for-women-in-science-journalism . Applications are now open. 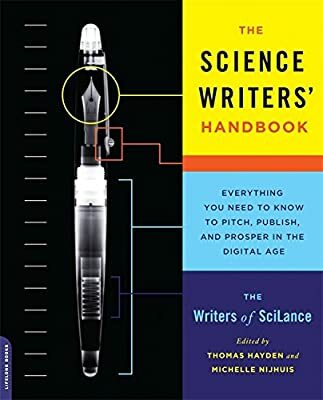 A great book for science writers, beginners and professionals, by expert science writers. It covers everything from writing a pitch to setting up your workspace to making money as a freelancer. A bit expensive though. The SciDev.Net has a innovative free online training course programme for scientists and journalists to become science communicators. Until now, I have completed half of the course and have found it be very helpful. The format is similar to Coursera with small modules followed by questions. Thanks for sharing the course @Cm.Manasvi ! This video is a good resource to know how to communicate to different audiences. Also, can’t believe no one has recommended’The Open Notebook yet! Really nice collection of resources and advice for aspiring science journalists. Particularly their database of successful pitches. I really like the concept of this video series by Wired. They showcase how every field is connected to everyone, and people can relate to it and understand it if the idea is communicated well.